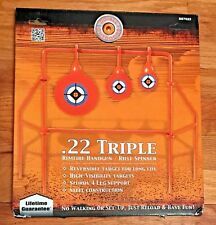 DO ALL OUTDOORS - .22 Triple Rimfire Handgun/Rifle Spinner SS7022 - NEW IN BOX! Spinner targeting system. This is a hands free spinning target. Do-All Outdoors Air Strike Pellet Shooting Target Rated for 22 rimfire. All-steel construction with slots to hold targets. Designed specifically for. 22 rimfire maximum airguns. 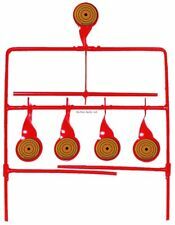 Do-All Outdoors Double Blast Spinning Targets for 9mm to 30.06 DBHR93 is a versatile spinning target set with the backyard shooter in mind. With these spinningtargets, you never have to worry about resetting after the shot. Boat Bling Hot Sauce 32oz Boat Detailer HS0032 USD 22.98. Woodhaven Custom Calls Strike 3 Striker Series Friction Turkey Call WH031 USD 34.99. Shell Holder- #13 390553 USD 6.65. Shell Holder- #13 390553 USD 7.56. Designed specifically for. 22 rimfire maximum airguns. Spinner targeting system. This is a hands free spinning target. Includes interchangeable spinning targets. All-steel construction with slots to hold targets. The strong, concealed, springs provide great popping action with every direct hit to the target. RATED FOR. 22 CAL PISTOL OR RIFLE: This steel target is specifically rated for soft nose lead. 22 caliber ammunition only (at a minimum of 30 yards). It is simply a must have for every shooter. The Do-All Outdoors Simple Shot is easily adjustable to fit most paper targets available. It is lightweight, easy to transport, and is easy to assemble and take down. It is constructed of solid steel and is easy to setup. The Helios is rated for. 22 caliber soft nose lead only. DURABLE: constructed of solid steel, built to last for hours of shooting. RATED: for. 22 caliber soft nose lead only. Pigeon Perch Clay Target (set of 4 holders). Always wear proper eye and ear protection. Always shoot with a minimum distance of 50 yards. Always secure and maintain a safe backdrop. Always observe all gun safety range rules. New Do-All Outdoors DO-MB155 Mega Boom Supersonic Reactive Target. Condition is New. Shipped with USPS Priority Mail Padded Flat Rate Envelope. The Impact Seal 3D Prairie Dog features realistic target construction and technologically advance material. The target includes a sturdy stand that gives you a solid base with ground spikes for added stability. Impact Seal Targets are constructed of technologically advance material. These durable targets are built for long life and countless hours of shooting fun. Larger impact seal targets can be used as a paper target backer. The Do-All Outdoors. 38-.44 caliber Auto Reset Jr targeting system is specifically engineered for soft nosed. 38 -. 44 caliber pistol and rifle shooters and has a hands-free resetting system. As the bullet strikes each target the force spins the target and locks it in an upright position. Box is in rough shape but everything is in the box. Do-All Outdoors - Money Shot Double Self-Healing Target Rated for .22- .50 Caliber Product Description With the Dead On Shooting Sticks, you can take a comfortable position, resting your rifle in the swiveling gun-v that allows you to take your shot at any angle without repositioning the shooting stick. They are constructed from strong yet lightweight aluminum and the unique shaft design used in all our shooting sticks provides a stronger more rigid leg to rest on. Adjusting the standing height is easy with the snap-lock / snap-release system which allows you to make height adjustments with one hand by flipping the latch open or closed with a flick of your thumb. Measurement marks on the lower legs allow you to quickly find a precise height. Do-All outdoors Bullet pong all caliber self healing target. The Do-All Outdoors' impact seal targets are constructed of a technologically advance material. These durable targets are built for long life and countless hours of shooting fun. •- As the bullet strikes each target, the force spins the target and locks it in an upright position. In order to reset the system, simply shoot the reset target or each individual target and begin another round of practice or competition. 2x4 Spike 2x4 Hanger • Easily Hang Your Steel Target. • Specifically Designed To Hold a 2 x 4. • Easy Set Up. Brand New! Shooting Targets For Your Next Range Day! Target Reseals Itself After Bullet Passes Through. Bullet impact spins target around base – no need to reset. Larger impact seal targets can be used as a paper target backer. Longer Life Technology. 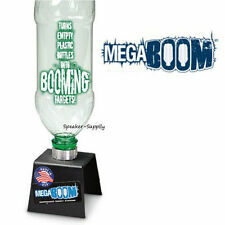 Shoot the popper and it will pop right back to the upright position giving you a visual report and an audible ding. - Spring Loaded Popper. Camping & Outdoor Gear. We Transfer The Savings To You! - Soft nose lead s only. NEW Avid Target Shooter Setup.Bullet Box.Shoot Bullseye.Marksmanship Training. The Do-All Outdoors. 17/.22 Bullet Box is a portable shooting range for. 22 &. 17 rim fire that gives any shooter the convenience of a quick and safe set up. Product Features: -Do-All Outdoors®. 17/.22 caliber bullet box. Made of solid steel, the Heli Pellet target from Do All Outdoors is sure to provide the entire family hours of shooting fun. Just stick it in the ground and watch it spin. Four Bonehead skull targets and four Accublue reticle targets are included. Orange parts had been spray painted again. All parts complete, good condition. Target Stickers unused. See all photos for details. I try to describe the item as accurate as it is. We'll try to resolve the problem. 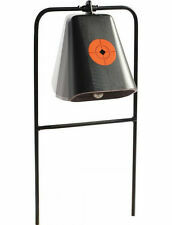 Do All Outdoors Big Gong Show 9 Self Healing Target Rated for. 22. 50 Caliber. Impact Seal Targets are constructed of technologically advance material. These durable targets are built for long life and countless hours of shooting fun. .17 / .22 Bullet Box This portable shooting range for .22 & .17 rim fire gives any shooter the convenience of a quick and safe set up, knowing that heavy duty construction will withstand the punishment from any avid shooter. This unit only weighs 20 lbs. And comes with an instructional DVD. - Fun Portable Shooting Range - Soft Nose .22's and . 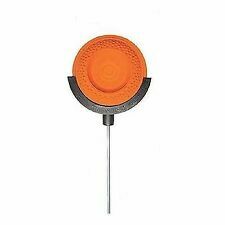 Included with this spinning target: Original box, service card and a couple extra orange bullseye stickers. This unit is a hands free spinning target. 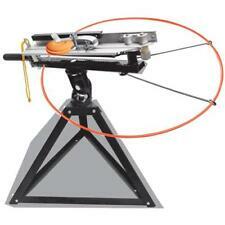 Do-All Outdoors® triple spinner target. Rated for. 22-caliber pistol and rifle shooters. Durable construction and four support legs for added stability. .22-.50 CAL TARGET, ORANGE. IMPACT SEAL GROUND BOUNCING REACTIVE TARGET. TARGET ACTION IS UNPREDICTABLE AND THEY CHALLENGE THE SHOOTER TO LOCATE AND READJUST FOR EVERY SHOT. THESE DURABLE TARGETS ARE BUILT FOR LONG LIFE AND COUNTLESS HOURS OF FUN. Model Number:RRDT22. Range Ready. 22 Dueling Tree. Our patent pending Tension Lock Technology reduces target flap. Race your buddies in a duel, with targets that lock into place when shot. No need to reset when finished. These action targets are unpredictable and they challenging the shooter to locate and readjust for every shot. The technologically-advanced material "heals" after impact and can handle thousands of rounds from. 22 to. 50 caliber as well as all shotgun calibers. EASY RESET: reset all targets by shooting the center. TESTED: for. 22 caliber pistol or rifle shooters. WEATHER-RESISTANT: with powder-coated paint, targets will keep their look in all weather circumstances. 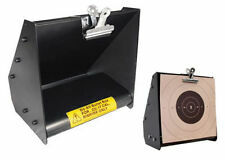 Gunpowder Gear 8" Gong Shooting Target with Stand. The 3/8" thick gong is powder coated for ultimate durability and target acquisition. Set it up close for hand guns or long range for higher calibers.